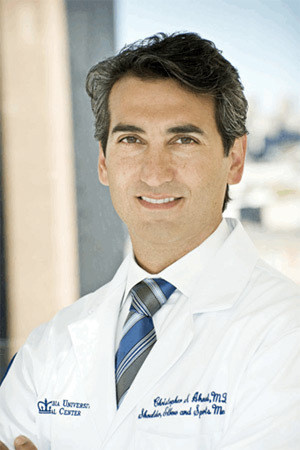 Christopher S. Ahmad, M.D. is a Professor of Clinical Orthopaedic Surgery at the Columbia University College of Physicians and Surgeons and an Attending Orthopaedic Surgeon at the New York-Presbyterian/Columbia University Medical Center. He also completed his orthopaedic surgery residency training there in 2000. In 2001, Dr. Ahmad completed a fellowship in sports medicine at the Kerlan-Jobe Orthopedic Clinic, which included physician team coverage for many professional teams and college teams. Dr. Ahmad currently serves as the Chief of Sports Medicine and as the Director of Biomechanics Research at the Center for Orthopaedic Research. He has authored more than 200 articles and 50 book chapters related to knee, shoulder, elbow, and sports medicine and has given more than 300 lectures nationally and internationally. He is the author of the textbook Pediatric and Adolescent Sports Injuries and Minimally Invasive Shoulder and Elbow Surgery. He conducts ongoing research in the areas of throwing-related injury prevention and treatment, ACL injury prevention and screening, biomechanics of the elbow, and surgical techniques for rotator cuff repair and shoulder instability. Dr. Ahmad is the Head Team Physician for the New York Yankees and the Rockland Boulders and a member of the Major League Baseball Team Physicians Association. He is president elect for the Major League Baseball Team Physicians Association and a member of MLB’s Pitchsmart Program. He is also co-founder of Baseball Health Network, which promotes the health of young throwing athletes. Dr. Ahmad received his undergraduate degree in Mechanical Engineering while playing 4 years of Division 1 soccer at nationally ranked Columbia University. He currently serves as the Head Team Physician for the New York City Football Club. He is also the Head Team Physician for local high schools and serves as consultant to local metropolitan soccer clubs, gymnastics, and swim teams. Dr. Ahmad’s recently published book SKILL: 40 Principles that Surgeons, Athletes, and other Elite Performers use to Achieve Mastery has received widespread praise from readers in a variety of professions. Dr. Ahmad lives in Manhattan with his wife and three children.